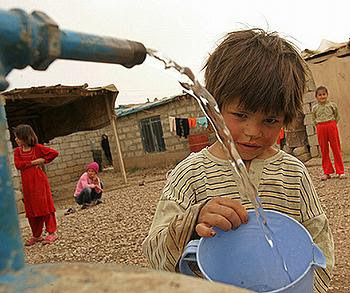 Hashim Hassan is the Deputy Director of the Baghdad Water Authority (BWA), and he admits to an ongoing shortage of clean drinking water for Baghdad's seven million residents. "We produce 2.5 million cubic litres daily, so there is a shortage of 1m cubic litres every day," Hassan explained to Al Jazeera. "We've added projects to increase water availability, and we are hoping to stop the ongoing shortage by the end of 2012." According to Hassan, 80 per cent of the Baghdad's piping network needs rehabilitation - work currently underway - in addition to positioning 100 compact units around the city, which would increase clean water availability until larger plants can come fully online.